Wireless charging pads for Qi-enabled smartphones and tablets don't come cheap, especially if they come from a brand that people have actually heard of. For a short time, however, the Nokia DT-900 is an exception to that rule of thumb. The accessory is now on sale at Ice Monkey for just $25 (shipping included), which is about half of what it retails for. There's a catch, of course – the Nokia DT-900 wireless charging pads being offered are refurbished units. Still, they should work just fine with any smartphone or tablet supporting the Qi standard for wireless charging. That includes not only many of Nokia's recent smartphones, such as the Lumia 920 and Lumia 820, but also the HTC DROID DNA, HTC 8X, Google Nexus 4 and the new Nexus 7. Interested? Well, better hurry up then as the deal likely won't last for long. 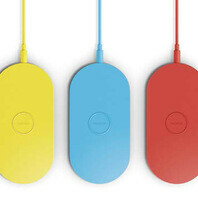 More details on how to get this Nokia DT-900 wireless charging pad are available at the source link. Nice, I bought one to use between my Nexus 7 and DNA. darn it i experienced you snooze you lose for the first time. slept all day now I missed out!!!! Works great on my Nexus 4. It fits perfectly.